I’ve made a few attempts at starting a blog in the past. I started one as a kind of travelogue back in 2009 that actually made it to about 10 posts. It was a novel concept, but I haven’t really had time to travel for pleasure since then (now that I’m done with graduate school, perhaps that will change in the next couple years and revamp my posting there). I started a more generic personal blog right before entering graduate school that didn’t make it past a couple posts, and most recently a similar attempt that was abandoned several months ago. This most recent attempt, which I started at polymerist.com, followed a format that I’m going to continue here – notes on random professional and hobby-derived advice. I use Pinboard to save an unhealthy number of links that I come across on the web, but chances are I’ll be using this medium to save some of the more profound ones. Having just finished graduate school less than a month ago and being on the hunt for a job since April, I’ve come across many articles emphasizing the concept of “web presence.” Most of the advice focuses on businesses or more creative/freelance individuals, but the general idea discusses the benefit of directing web traffic (i.e., search engine queries, etc.) to a select few sites to build name association and weed out irrelevant results. It’s such an important concept nowadays, that it has its own field. I don’t own a business, nor could I really ever justify the services of an “web presence consultant” (yes, they exist), so in the spirit of DIY culture, I’ve taken my own approach. Made a website with a domain that is my name. If you have a common name that is already taken, try a different suffix (i.e., .com, .org, .net, etc.). If that fails, try a professional-looking variation. There are also a lot of specialty suffixes that correlate with professions or interests (e.g., .photography, .graphics, etc. ), so look for those too. Hover.com has a great selection of these with superb customer service and pricing. Made a Facebook Page for my professional image. This article has some great tips and reasoning for creating a professional Facebook presence. 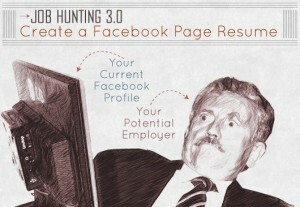 In summary, many employers will make an initial web search for your name, particularly on Facebook. With your privacy settings (which should already be up to date) in action and a public, professional landing page, you should be able to maintain an unscathed image. If you don’t want to read the article cited above, just take a look at the defining image they used in it. With that last tip in mind, I made anything online with my name on it and containing personal opinions of mine, private to only friends. Even if you don’t have posts that are regularly littered with curse words or questionable references, you may post political or religious opinions that may strike the wrong chord with a potential employer. TL;DR – When in doubt, just use common sense.